S177 Duracell PC177A, Energizer EN177A Battery equivalent to TR-177, E-177, E177, 7LR44, 7MR44, 7NR44, 177A, A177, TR-177R, NEDA 1606, 1606M, 1606A, Panasonic H-7C. Type: Silver Oxide / Alkaline. Voltage: 10.5 V.
Length: 48.5 mm. Diameter: 13.9 mm. Price: £9.49 each. £8.99 each if you buy two or more. Postage and packing included. 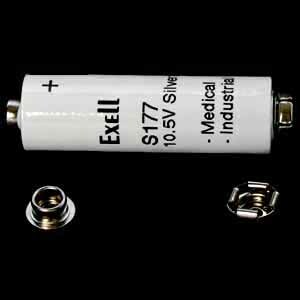 This S177 / A177 battery is silver oxide or alkaline and cylindrical; it is a little shorter in length than a standard AA battery and a little slimmer. It sports a pair of mini-snap connectors, one at each end. It produces 10.5 volts. It is the perfect replacement for the hard to find Duracell PC177A and Energizer EN177A. This TR177 sized battery fits several long shotgun type condenser microphones such as those from Sony and the Shure SM82, Shure SM82-LC. This TR177 battery uses silver oxide or alkaline chemistry. This makes it a perfect replacement for the alkaline Duracell PC177A and Energizer EN177A, but has greater longevity and more consistent voltage. It is also a good replacement for those 9.8 volt or 9.45 volt Mercuric Oxide versions. This battery also seems to be a good alternative to the 7MR9 and H-7D mercury batteries in several applications such as the Sony C76,and several other microphones too, though our A1611 battery is better. These TR177 batteries have a shelf life in excess of four years. Why not buy two or more packs, take advantage of our reduced price and make sure you are not left unable to use your device next time your battery runs out.